Problem: Where To Put The Pet’s Bowls? Addressing the modern needs of a large family and incorporating every family member is necessary in designing the perfect kitchen—even including the family dog and cat! 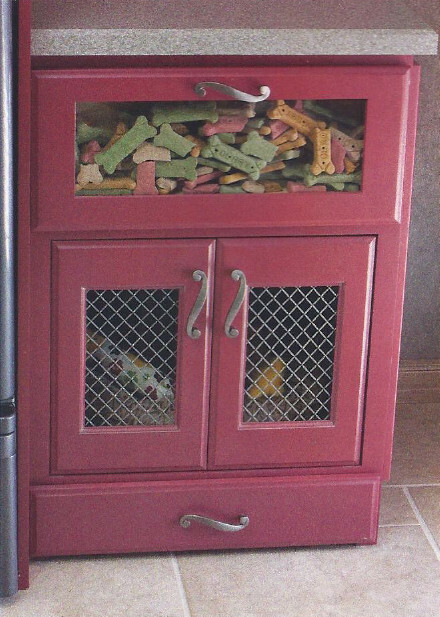 This clever pet-food nook is another space saver, integrated inside a cabinet; no one trips over the food bowls anymore! Contact Kitchen & Bath Details to speak with a designer about where to put this design solution in your new kitchen! We apologize for the grainy photos, but we just had to share how cool AND useful this cabinet can be in the kitchen or auxiliary room.